Google just updated its Goggles app to version 1.3 and added three noteworthy features that make it even more desirable than it was before. First is the ability to scan QR codes without actually taking a picture; just hover your camera over the image and Goggles will automatically recognize it. Second, Goggles now recognizes ads in major US newspapers and magazines. I couldn't get this to work, but Google claims it will work with any ads dated since August 2010. The last feature is the one that has everybody talking - Google Goggles is now capable of scanning and solving Sudoku puzzles in a matter of seconds. Surprisingly, it worked - the app had no trouble identifying numbers whatsoever. 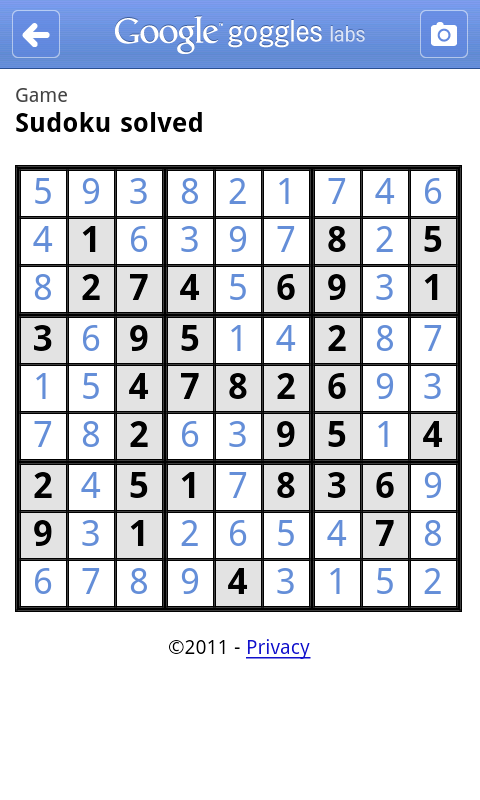 If you're a Sudoku fan, you probably won't be cheating anyway, but it's definitely a neat trick, if only because it works so well. If you're still not convinced, try the feature out here or watch the video below. Want Goggles? Scan the QR code below or click on it if you're viewing this on your phone.